More faith communities should hold these kinds of events! Emmanuel United Church held a barbecue yesterday afternoon which despite the rain, was well attended. It was an opportunity for the faith group to show case resources and groups doing 'good work' in the community. I was there representing Environment Hamilton and of course Greening Sacred Spaces. Energy saving kits were given out as well as 'Eat local' maps and 'Passport to Hamilton' maps. paints and idols made of non-recyclable material, schools, environmentalists and some states are encouraging "greener"
children are learning to make eco-friendly idols. idols strewn along the shore. But a growing number of Indians are opting for smaller clay idols which they immerse in water at home. eco-friendly in our festivals. It's something that's in our control." 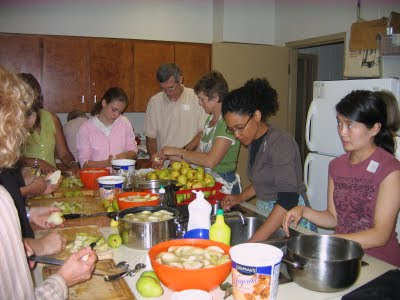 Greening Sacred Spaces and The Hamilton Fruit Tree Project (projects of Environment Hamilton), along with Dundas Ontario in Transition (DO-iT) teamed up yesterday afternoon to offer a canning workshop. 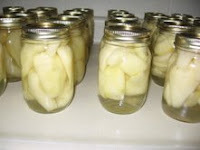 We learned how to preserve fresh pears. The kitchen was bristling with energy and much knowledge: we soon discovered that there are many ways to can! We enjoyed ourselves immensely (all 19 of us) and look forward to the next workshop (St Paul's Anglican Church in Westdale). Convincing the custodian to 'go green' is a problem for many faith groups with environmental teams. How do you get the janitor to use natural products when he has been using bleach for 25 years? What is the way to convince the care taker that her work load will be all that lighter if she got on board with recycling? This was one of the themes that came up at a meeting with the leadership of 8 faith communities in Hamilton this pass month. Another all time issue is that preaching to the converted aside, how do we encourage members of our faith groups to get with the picture and get green? You can look forward to a workshop that will be examining these concerns and giving you ideas and ways to tackle them. In November (the date is still to be decided upon) we will be holding a workshop at Stanley St Baptist Church in Hamilton. This is of course an interfaith event and all are welcome so please check in again for an update.